Are you tired of reaching the wrong destination every time you use GPS navigation? MapmyIndia Maps & Directions is a detailed map of India which not only gives you the address your desired destination including the house number but also the street-level details. MapmyIndia Maps & Directions is that app to have as you can use Step-by-Step driving directions from your current location to most of the parts in India. MapmyIndia Maps & Directions is equipped with the latest maps data. 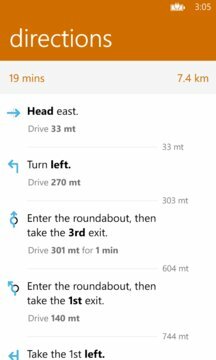 Not only this, now you can view maps in Satellite and Hybrid modes too. You will have access to millions of places of interest with their road maps. Road map of India is now more advanced and interactive. A new U.I. to make your experience better. A faster navigation within the app. Give “Feedback” directly from the app. Create easy “List” of your favorite places. Share reviews of a place directly on Facebook & Twitter. Nearby- Now get all the nearby places of interest from your current location. Places such as Emergency & Hospitals, Shopping, Eat & Drink, Transport, Entertainment, Hospitals, Tourism, Sports, Health & Wellness, Religious Places, Education, Landmark, Offices and much more. Friends that just not it, to make things even easier we have added Brands too. 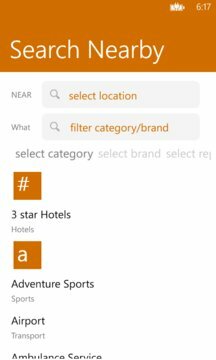 Now you can search nearby places according to the brand that you want to choose. Brands such as State Bank of India, Life Insurance Corporation, Hero, Muthoot Finance, Maruti Suzuki, DTDC and loads more. >Traffic Issues- Report issues such as Road Work, Jam, Accidents, Hazard, Low Visibility and Road Closed. >Smart City Issues- Reports city level issues like Electric Failure, Water Wastage, Unsafe Areas, Traffic Violations. >Map Issues- Report issues such as New Road, Incorrect Name, Place Missing, Invalid Turn, Road Missing, Incorrect location for a place etc. >Others- Inform people around you about Public Procession, Gated Community and Non-Public Area. View Rating- View the rating of a place and decide if you want to go. Rate Places- Don’t like a place? Rate it! Tell others. Read Reviews- Read reviews of people who have visited a the place. Add Reviews- Share your experience with others. Login- Login to save your routes, places and settings. We believe in smart work. Feedback - Love something? Want improvements? Want to see more new things? Need help? Let us know through our feedback function and our team will be right on it. MapmyIndia Maps & Directions makes sure that you find what you're looking for and take you there. So what are you waiting for explore India like never before with MapmyIndia Maps & Directions. Install Today!